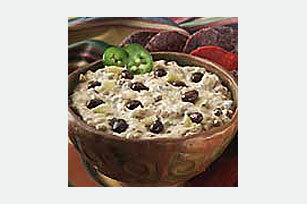 Create zesty Southwestern flavor with this Black Bean Dip Recipe. No party spread is complete without a creamy & delicious Black Bean Dip Recipe. Mash beans with fork in large bowl. Add remaining ingredients; mix well. Cover. Prepare as directed, substituting canned pinto beans for the black beans.